Making full use of a cloud computing solution depends on how well customers can leverage the software assets they already own. 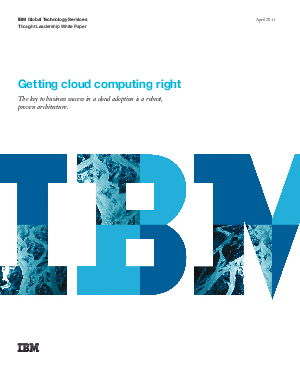 This white paper, written by IBM's Global Technology Services team, acknowledges that CIOs and business leaders face a big challenge making sense of all the vendor offerings in the marketplace about cloud computing. The white paper points out that it is important to remember that cloud computing is not just about data center technology. It's about streamlining business processes to make organizations and people more strategic, more responsive to change and more oriented to service delivery.